The Maxxis M6024 is built for the scooter rider looking for a comfortable, versatile tire for both on-road and off-road use. The M6024 features a knobby tread pattern for optimal traction when riding in off-road terrain and also features a durable compound, perfect for long-lasting, comfortable street riding. 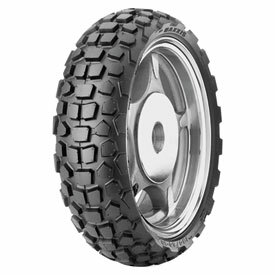 Knobby tread pattern designed to excel in both on-road and off -road conditions. Durable compound for exceptional off-road and on-road wear. Will this fit Honda grom 2015 ? BEST ANSWER: Maxxis M6024 Front Scooter Tire 120/70-12 (51J) Fits: 2015 HONDA Grom 125 Part# 1907450001 and Maxxis M6024 Rear Scooter Tire 130/70-12 (56J) Fits: 2015 HONDA Grom 125 Part# 1907450002. I show both the tires listed above will work with the 2015 Honda Grom 125.